Garden centers are fair to popping with seedlings for vegetable gardens, and, this weekend’s predicted cold snap notwithstanding, it’s a perfect time to plan what will go in the ground for summertime goodness. All of us can’t have an acre garden. (Those of us who actually grew up with garden plots that large can actually do without vast rows and rows of produce and the labor that went with them.) But even if you aren’t set up to have your own garden, it’s cool to have some new recipes to apply to fresh, seasonal produce. 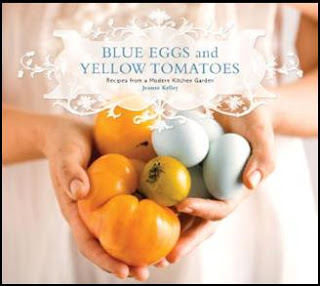 Just out this month is “Blue Eggs and Yellow Tomatoes,” (Running Press Books/April 2008/$35.00) by Jeanne Kelley. (And there’s a farmer in Randolph County who has chickens that produce blue eggs, so don’t laugh. A longtime Bon Appetit contributor, Kelley has made the idea of urban sustainability a culinary goal. Despite her Los Angeles zip code, Kelley’s backyard kitchen garden allows her to indulge her desire for fresh, organic produce year ’round. It’s also home to her pet goat and Araucana chickens, which provide her plentiful milk and the gorgeous sky blue eggs that are the namesake of her cookbook. On the surface, this doesn’t appear to be a book for “novice” cooks or those who don’t have the income or time to seek out fresh produce. Don’t be fooled by it’s cover, though. The recipes aren’t run-of-the mill dishes you’d find at the local “meat-n’-three,” but they don’t appear to be hard, either. Kelley points out that ease of preparation is an emphasis. In addition, she shares stories on how she created her urban oasis: a kitchen-garden primer that celebrates the simple joy of growing your own produce, plus brief guides on container and community gardens, raising and keeping backyard chickens, composting, and growing your own exotic ingredients. Kelley attended La Varenne Ecole de Cuisine in Paris. For the past 20 years she has been affiliated with Bon Appetit magazine and has been a contributing editor for the magazine since 1999. She has developed recipes for more than 60 features ranging from easy desserts to elaborate holiday menus. Kelley is a frequent contributor to Cooking Light magazine, and many of her recipes and articles have appeared in the Los Angeles imes Magazine, Natural Health, Islands, and Spa magazines.